Is ABC “Resurrecting” Traditional Media? I’m a PR guy, but I still go around taking photos of interesting marketing ideas. 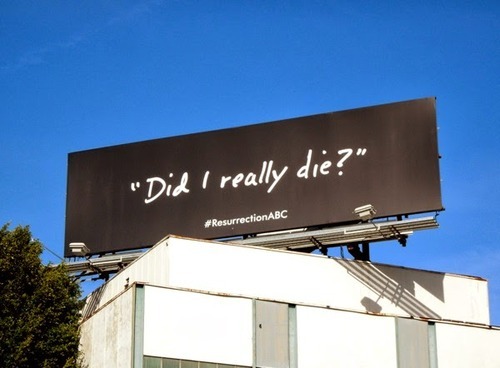 On a recent trip to Los Angeles, I kept seeing billboards like the one above. The ad is stark and simple: one message, one hashtag for social media. The ad creates buzz for the product, a core goal of outdoor advertising. The use of the hashtag is indicative of the value of social media connected campaigns. Twitter tends to be used by people we call “influencers” in marketing circles. These are people who are likely to influence purchasing, viewing, voting, or other decisions. They are the friends who always know what is going on with a particular topic. In Los Angeles, a city dedicated to entertainment, Twitter becomes part of how people interact with and see the world. This strategy carries significant risk. In the past I have helped run hashtag campaigns on Twitter that started trending, and were quickly overtaken with irrelevant content from other people and organizations. Hashtags are inherently user driven, and a large volume of off-topic posts can change the discussion. The ABC network likely had robust monitoring in place and some reserve funds that could be spent quickly to deploy promoted tweets to disperse a potential hashtag takeover. This risk is significantly increased with a sensitive religious topic like resurrection, a central concept within the Christian faith. This type of campaign is difficult in a smaller market with a limited target audience. Twitter is a global platform requiring vast resources and a large (ideally national) audience for a campaign like this. Monitoring software for this type of campaign is expensive and uses what Twitter refers to as “fire-hose” access to the Twitter content stream. Adding to this is the constant need to fight any potential takeover for the duration of the time the billboard is up. In the Eugene/Springfield area, this can last a month or more. ABC faced additional challenges. The campaign strategy relied upon a huge, national audience and big spending to create connections with the television show. And the network had to penetrate in a market where residents are constantly inundated with messages from all angles. In a city that produces many of our television shows and movies, standing out can be difficult. In this instance the choice of a simple, high-risk campaign centered around social media was a sensible option. Chips Ahoy: One Smart Cookie!